A contemporary dining table that will maintain its appearance for years to come, the Metropolitan Dining Table from Zuo Modern will sparkle day after day. This elegant dining table features a spacious faux wood top as well as strong, durable legs that provide exceptional support. 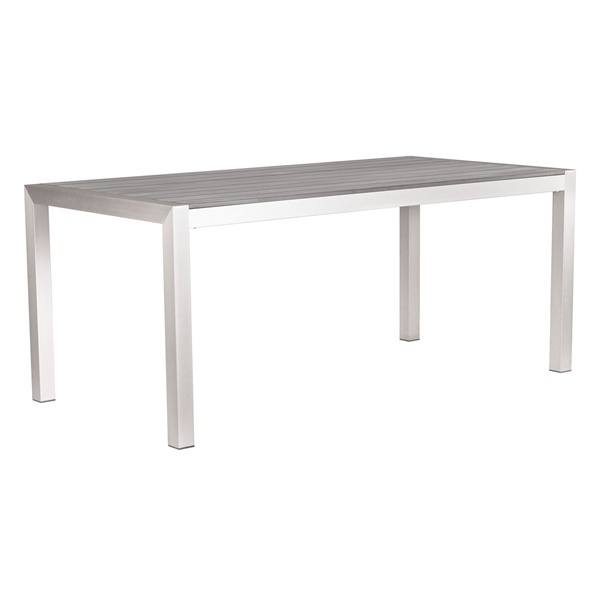 In addition, the table delivers a brushed aluminum finish and a sleek, modern design that help it stand out. Select a dining table that blends form and function perfectly � the Metropolitan Dining Table. Contemporary design makes the dining table a great choice for those who want to host large dinner parties regularly. Faux wood top is both stylish and practical. Strong, durable legs offer outstanding support. Boasts a brushed aluminum finish that helps the table dazzle. Does this table have a central umberella hole? Unfortunately there is no central hole to support and umbrella stand.